The absence of meaning in art is a rare occurrence. A brush stroke is never empty, a shade hardly hollow. Behind the seemingly uncalculated curations is a strong undertow. Values are the muses that fuel the human drive and dictate the human creativity. It is the subconscious influence, the North Star that guides the process of an artist and, ultimately, the artist themselves. Art is a direct reflection of the things we hold dear, the things that matter to us, and, at times, the vanishing remnants of values of an era almost forgot, fossils of a value-centric ideal, both simultaneously disappearing and clawing to be remembered at the sprint of the present. 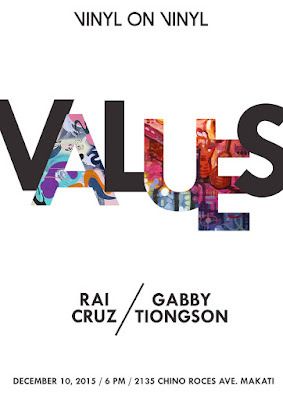 With a divine chaos of color and grit, reminiscent of both pop tart aesthetics and textured memories, Gabby Tiongson and Rai Cruz's "Values" goes back to basics and gets down to what really matters.